July 20th would have been the 80th birthday of civil rights hero Ron Walters. If you haven’t heard of Walters you unfortunately wouldn’t be alone, but you are certainly familiar with his impact on the civil rights movement. In July 1958, frustrated with being refused service at a local soda fountain, Walters and his cousin, Carol Parks-Hahn, organized one of the first lunch counter sit-ins to protest its refusal to serve African American patrons. While this effort didn’t receive national (or, for that matter, local) media attention, it proved to be an effective tactic in the fight for desegregation – and other activists took notice. Over the next couple years, a coordinated grassroots effort of similar sit-ins unfolded across the South. 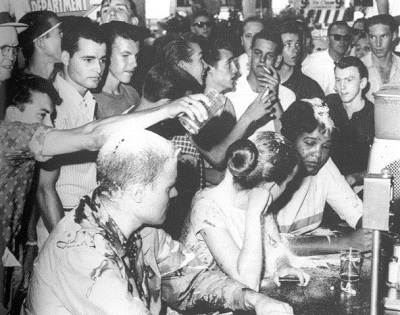 Such protests didn’t just take place at soda fountains and diners. They were also held in libraries or on public transportation. Collectively, these hundreds of local acts of resistance disrupted the status quo and sparked momentum in the civil rights movement – as well as set an example of the power of people working together to create social change. But, in a 2006 interview with Carla Eckels of NPR’s Weekend Edition1, Walters compared the segregation in Wichita, Kansas during the 1950s to the likes of Mississippi. Most restaurants and other public establishments there also refused to serve African Americans. So, in July 1958, 20-year-old Walters and his 19-year-old cousin Parks-Hahn, both members of the NAACP Youth Council, coordinated a sit-in at the Dockum Drugstore. “We deliberately chose Dockum because Dockum was part of chain, the Rexall Drugstore Chain, and we felt if we could do something there in the heart of town, that it might have an [economic] consequence,” Walters told Eckels. And it did. For three weeks, student protestors quietly occupied seats at the soda fountain counter, remaining there for several hours at a time, without being served. Walters described how other patrons would come into drugstore and consider occupying an empty stool next to the students but change their minds, not wanting to appear to be participants in the protest. “Some came in, looked at what was happening, cursed us out, because they understood then that we were depriving them of this service,” he explained. However, the Wichita sit-in was largely ignored by the media. “Unlike the national press coverage that the 1960s sit-ins received, many of the student protests during the late 1950s had not been covered by national and/or local press,” Thomas Bynum wrote in his book, NAACP Youth and the Fight for Black Freedom, 1936-1965. These stories might have been ignored or downplayed in newspapers based on the politics of editors, or out of fear of upsetting advertisers. In addition, according to Bynum, at the time of the Wichita protest, the national NAACP did not officially approve the sit-ins or other direct-action methods of protest initiated by youth council activists like Walters. The wider impact of the Wichita protest was seen in the spring of 1960, less than two years later, when the NAACP launched a legal defense program for student protestors. The organization released an in-depth report3 sparked by a series of sit-ins that began famously on February 1 of that year in Greensboro, North Carolina and had spread through 65 southern cities. 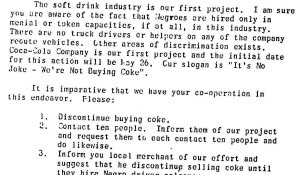 In many of these cases, after a few weeks of diminished sales and bad publicity, business owners gave in and agreed to serve the student protestors who filled the seats at their lunch counters. This fight for desegregation was often tumultuous, resulting in additional forms of protest in conjunction with the sit-ins, such as picket lines and demonstrations. These activities were sometimes met with firehoses, tear gas, rioting, bomb threats, assault and numerous arrests, as detailed in the NAACP’s report. The lunch counter sit-in controversy has caused substantial losses in volume, merchandising uncertainty and constant worry among variety store managers who have to bear full local responsibility for handling this social and economic hot potato. And of course, this prediction proved true. Activists in the civil rights and Black Power movements went on to successfully employ the strategies and tactics used by protestors in the sit-ins to raise awareness of racial disparity and to bring about profound change over the course of the next decade. Even though Walters and the sit-ins he organized aren’t as well-known as some of the other figures and events of the civil rights movement, he went on to become a prestigious public intellectual and advocate for the African American community. According an obituary in the Afro-American Red Star article6 in 2010, Walters received a Ph.D. in International Studies and taught at several distinguished universities, including Princeton, Harvard and Howard, where one of his students was U.S. Rep. Elijah Cummings (D-Md.). "As a teacher, he always found time for his students," Cummings told the publication. "When he was at Howard, we would fight to get in his classes. He was always telling us to reach high, to be a part of the political process." In recent years, numerous books have been written about Walters political development, contributions and ideologies – a boon to researchers seeking inspiration, insight and information on African American leadership and activism. See the video, February One in Academic Video Online, download the Black Freedom essays, sign up for a demo, and explore resources from slavery to modern times. Covin, D. (2012). Black Politics in a Time of Transition. Mitchell, M., & Covin, D. (Eds.). (2013). Grassroots and Coalitions: Exploring the Possibilities of Black Politics. Smith, R. C. (2018). Ronald W. Walters and the Fight for Black Power, 1969-2010. Smith, R. C., Johnson, C., & Newby, R. G. (Eds.). (2014). What Has This to Do with the Liberation of Black People? : The Impact of Ronald W. Walters on African American Thought and Leadership. Walton, H., & Smith, R. C. (2014). 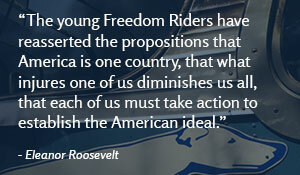 American Politics and the African American Quest for Universal Freedom. The stories in ProQuest Black Historical Newspapers and the documentation in ProQuest History Vault allow researchers to uncover the stories of other unsung heroes of the civil rights movement. For primary source, archival research collections, see History Vault’s Black Freedom Struggle in the 20th Century and NAACP Papers collections. The Sit-In Story: The Story of the Lunch Room Sit-Ins [Streaming Audio]. (n.d.). Folkways Records. Available from Music and Dance Online. The Nashville Sit-in Story: Songs and Scenes of Nashville Lunch Counter Desegregation (by the Sit-In Participants) [Streaming Audio]. (n.d.). Folkways Records. Available from Music and Dance Online. Cerese, R., & Channing, S. (Producers). (2004). February One [Video file]. California Newsreel. Available from Academic Video Online. Kansas Sit-in, a First, Gets Its Due at Least (2006). Washington, D.C.: NPR. Available from ProQuest Central. Bynum, T. (2014). NAACP Youth and the Fight for Black Freedom, 1936-1965. Available form Ebook Central. A Follow Up Report on the Student Protest Movement After Two Months. Available from History Vault – NAACP Papers: Board of Directors, Annual Conferences, Major Speeches, and National Staff Files. Folder: 001473-021-0569, page 3-16. Fairchild, N. S. (1960, May 10). Planning Problems Mount with Chain Unit Sitdowns. Women’s Wear Daily, 100, 1-1, 60. Available from the Women’s Wear Daily Archive. Lunch Counter Pressure Cracks South. (1960, Aug 20). The Chicago Defender (National Edition) (1921-1967). Available from ProQuest Historical Newspapers – Black Newspapers. Chikwendu, T. (2010, Sep). Ron Walters, Community's 'Tallest Tree,' Dead at 72. Afro - American Red Star. Available from ProQuest Historical Newspapers – Black Newspapers. *While the civil rights movement is often thought of as a southern movement, scholarship in recent years has identified vibrant movements for civil rights in northern and western states. For more information on civil rights in the north and west, see this blog post. **For NAACP correspondence and press releases pertaining to the Wichita sit-ins, see ProQuest History Vault, “Wichita, Kansas youth programs, 1956-1964”, FOLDER: 001467-003-0650, in NAACP Papers: Branch Department, Branch Files, and Youth Department Files, and “Sit-in publicity, including press releases, NAACP support, mass arrests, demand for federal protection, Harry Truman's opposition, desegregation of Texas lunch counters, and racial self-defense policy”,: FOLDER: 001473-022-0205, in NAACP Papers: Board of Directors, Annual Conferences, Major Speeches, and National Staff Files.